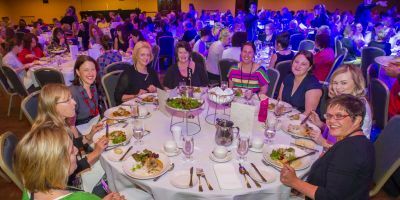 Established in 1958 Home Economics Victoria is a Health Promotion Charity, a Registered Training Organisation and a Public Company Limited by Guarantee. Our Chief Executive Officer, Carol Warren manages a small team of staff who operate the full-time office. Our team of seven directors are responsible for the governance of Home Economics Victoria under the leadership of President Alison Kuen. The three sets of shapes that make up the starburst configuration of Home Economics Victoria’s visual identity represent the interrelationship between the individual, the home economics profession and Home Economics Victoria. The individual is represented as the central shape, with the idea that all can be shared - the linking and communication of ideas and information creates a stronger whole. The logo also represents the relationship between individuals, families and communities; similarly, households, communities and the global community. The bright colours represent vitality, health and positive energy. The focus on green supports the emphasis on Home Economics Victoria on sustainability and the promotion of sustainable futures for individuals, families and communities. The overall design suggests a Southern Cross formation within a global context, linking Australia with the rest of the world. The first meeting of the Home Economics Teachers Group was held at MacRobertson Girls High School on Friday 24 October 1958 at 8pm. At the end of the decade there were 300 members. An incorporated company officially took place in June 1977 when the group became the Home Economics Teachers Group of Victoria, ‘a company limited by guarantee'. By the end of 1977 the organisation had close to 400 members. A boom time for Home Economics and a name change in 1983 to Victorian Home Economics and Textiles Teachers Association. The first Annual Conference was held in 1979. The HSC Home Economics: Human Development and Society subject flourished with 8000 students enrolled in 1989. In April 1993 VHETTA purchased its own premises in Mount Waverley, and added an additional second story in 1995. 2008 denoted a name change to Home Economics Victoria aligned to a new look and new logo. In 2005 approval was granted to become a Registered Training Organisation thus enabling the delivery of our own Graduate Diploma in Home Economics Education. We celebrated the 40th birthday of the iconic Cookery the Australian Way in 2006 and we delivered a major project for the Department of Health, the Fruit + Veg Program in primary schools. The organisation now had a membership of 800. In 2010 our offices relocated to Docklands and in 2012 we hosted the 22nd World Congress of the International Federation for Home Economics. We became a Health Promotion Charity and also delivered the Healthy Eating and Food Literacy in Secondary Schools project on behalf of the Department of Health. Our long-standing partnership with the Department of Education and Training continued through the Strategic Partnerships Program. Membership numbers have increased to more than 950. Home Economics Victoria advocates skills for life to achieve optimal and sustainable wellbeing for individuals, families and communities.